Warm, fall-inspired spices and a crunchy-sweet oat-streusel topping take these comforting oversized muffins over the top. We watched an episode of 30 Rock last night, one where Liz Lemon sports a “slanket” (you know, a Snuggie? A blanket with sleeves? Of course you know). We both suffered a moment of confusion before I learned that, really, it was just a big blue scarf. Whoops. 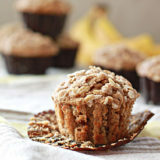 What do Snuggies, Liz Lemon, and my embarrassing faux pas have to do with Spiced Banana Streusel Muffins? Not a goshdarned thing, actually, except that maybe I should have made some for my scarf-wearing coworker as an apology. Aside from watching 30 Rock on Netflix this weekend, I also whipped up a batch of these muffins. Our ever-picky toddler decided bananas were actually NOT her thing right after I bought a bunch of them, so we had a few overripe bananas on hand. No worries. There are fluffy banana pancakes, banana spice snack cake, or, hey! 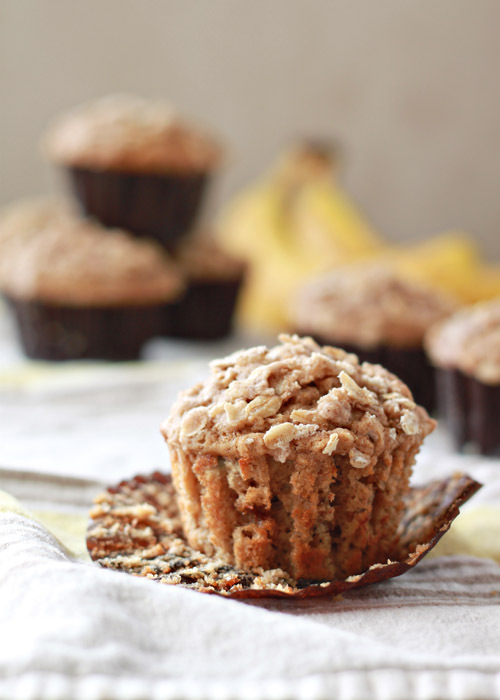 Spiced Banana Streusel Muffins to be had! 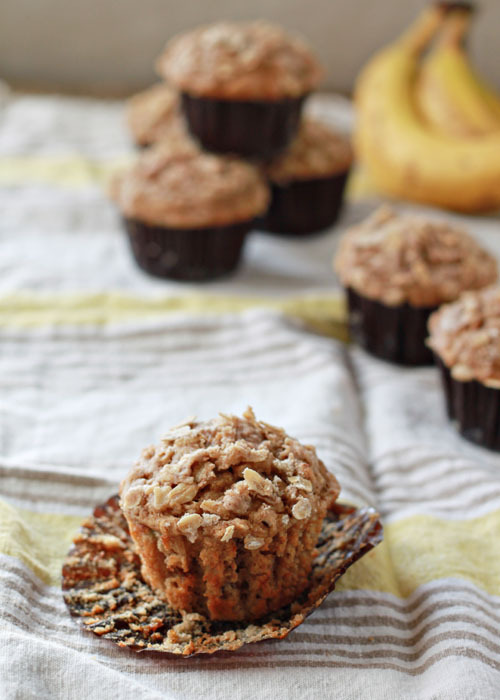 I grabbed another favorite muffin recipe, chocolate banana marble muffins, and tweaked it a bit here and there to come up with this moist and tender spiced banana muffin. I added warm, fall-inspired spices – cinnamon, allspice, nutmeg, and cloves – and sprinkled a crunchy-sweet oat streusel topping over the top. 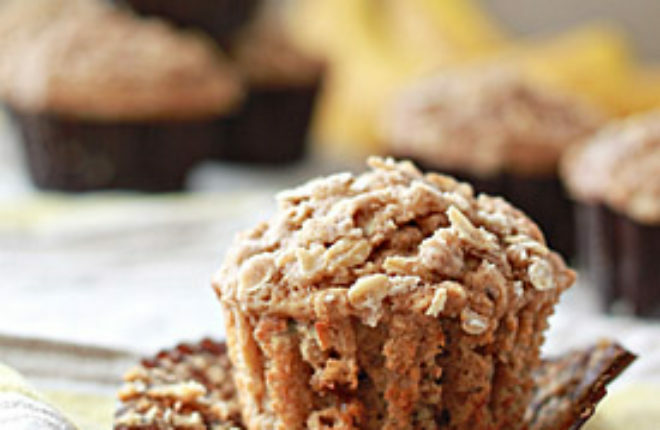 We loved these comforting, homey muffins – and they made the house smell terrific. I love that. They just make you want to butter one up, grab a mug of coffee, and curl up on the couch in your Snuggie. Preheat the oven to 375 degrees Fahrenheit. Line a standard-size 12-cup muffin tin with cupcake liners. In a large bowl, whisk together the flour(s), oats, baking powder, baking soda, salt, cinnamon, allspice, nutmeg, and cloves. In a medium bowl, mash the bananas, then whisk in the buttermilk, brown sugar, oil, egg, and vanilla extract, stirring until blended. Pour the wet ingredients into the flour mixture, and whisk just until blended. Make the streusel topping. In a small bowl, stir together the flour, oats, brown sugar, cinnamon, and salt. Using a pastry blender, two butter knives, or your fingers, cut the butter into the flour/oat mixture until it is the consistency of coarse crumbs (the butter pieces should be about pea-sized). Distribute the streusel topping evenly over the muffins. Allow to cool for about five minutes in the tins, then remove and place on a wire rack to cool. They keep in an airtight container at room temperature for 2 - 3 days, or freeze them in a zipper bag for a couple of months. * Can substitute milk + 1 tablespoon of vinegar. Stir and let sit for 5 - 10 minutes, and, voila! Buttermilk! Yummy! I love your little anecdote about your co-worker and the “Snuggie”. What can you do? I love putting spices in everything right now, and these muffins just sound so warm and comforting! With the streusel as well…so yummy! Love love LOVE this recipe! Thank you for sharing!! !